The New York Yankees have lost the wrong player to injury at the wrong time. 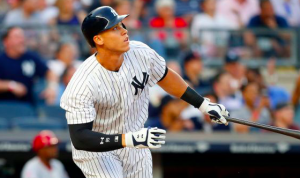 Outfielder Aaron Judge suffered has suffered a fractured wrist. He was hit by Royals starter Jakob Junis during the first inning of Thursday’s win. The Yankees say that surgery won’t be needed to address the injury. However, he will be placed on the DL and will be unable to swing a bat for at least three weeks. Judge actually stayed in the game and took another at-bat as the team’s DH two innings later. But he did not come out the next time through the order after trying to hit in the batting cage with hitting coach Marcus Thames. Judge has easily been New York’s best offensive player this year. He’s currently hitting .285 with a team-high 26 home runs. He also leads the team with an OPS of .947. The Yankees have plenty of other sources of power in their lineup. But they become far less intimidating without Judge. Of course, three weeks without swinging a bat doesn’t mean Judge will be back in three weeks. He will likely need a few at-bats in the minors to get himself ready, assuming the injury is fully healed after three weeks. It’s possible the Yankees won’t get Judge back until early September, which is a significant loss for one of the best lineups in baseball. The injury to Judge comes on the heels on Gary Sanchez re-aggravating his groin injury and returning to the DL. Outfielder Clint Frazier also returned to the DL earlier this month with concussion symptoms. Those losses leave the Yankees a little shorthanded in the outfield and at the DH spot. For the time being, Giancarlo Stanton, Aaron Hicks, and Brett Gardner will get most of the time in the outfield. Journeyman Shane Robinson is also an option, but he’s not an accomplished big league hitter. Barring Robinson playing every day in the outfield, the Yankees have no obvious option at DH until Judge, Sanchez, or Frazier return from the DL. Brandon Drury could have been an option before he was traded Thursday afternoon in a trade for J.A. Happ. The loss of Judge will no doubt make it harder for the Yankees to catch the Red Sox atop the AL East. The Yankees are currently 4.5 games behind Boston. Judge is certain to miss a four-game series against the Red Sox next weekend. Those games are critical to the Yankees being able to close the gap. Obviously, there’s more than enough time to make up 4.5 games. But that task becomes significantly harder with Judge sidelined for at least three weeks. The injury is no doubt a big blow to New York’s chances of winning the AL East and avoiding the dreaded Wild Card Game.